NASSAU, The Bahamas -- Prime Minister and Minister of Finance the Rt. Hon. Perry Christie said that it gave him great pleasure to celebrate, along with the proud members of the Royal Bahamas Defence Force, on the occasion of the commissioning of HMBS Kamalamee, the eighth of nine vessels that have been acquired and delivered under the $232 million Sandy Bottom Project. "These vessels, along with the strategic infrastructure currently being built within the Central and Southern Bahamas, represent more than just tremendous growth, but clearly signify the crossing over of The Royal Bahamas Defence Force (RBDF) into a modern era in its history," Prime Minister Christie said, during the Commissioning Ceremony for the new vessel at the RBDF Base, on February 24, 2017. "Just over two years ago during a similar ceremony for HMBS Arthur Dion Hanna, which was the first vessel to be delivered under the Sandy Bottom Project, I emphatically affirmed my administration's resolve to secure our nation's borders," he added. "In the outcome, the significant capital outlay of over $232 million invested in the 'Sandy Bottom Project' will result in completely revolutionizing the Force's operational capacity, which plainly signals to all and sundry our intent to guard our national heritage in this regard." "Our efforts, in this respect, is a response, in part, to the heightened volatility of today's security environment and evinces my administration's conviction in the notion that the obligation to secure a nation is the principal aim of governance," Prime Minister Christie said. He added that effective national security, however, requires constant innovations, progressive realignments and meaningful adjustments; regardless of a nation's size or perceived place in the world. Every nation, whether great or small has an intrinsic obligation to protect its borders and its citizenry, and it is for this reason that the mandate and the responsibility of the RBDF is an onerous one, he stated. 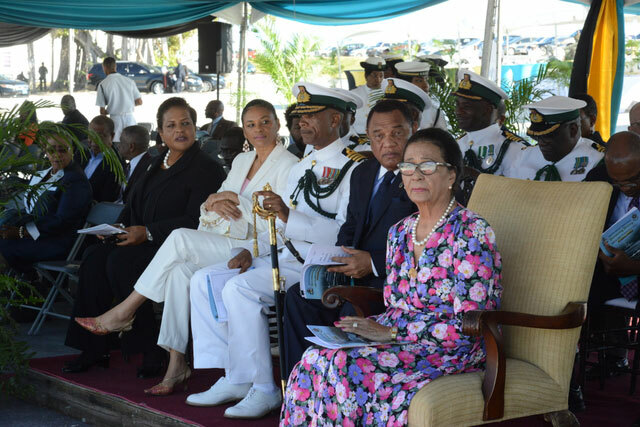 "Toward this end, today's ceremony represents the near completion of the first of three phases -- under the Sandy Bottom Project -- essential to putting the Defence Force in perhaps, what is historically, the best possible position to guard and protect the sovereign inheritance of the Commonwealth of the Bahamas," Prime Minister Christie said. The completion of the first phase will take place after the ninth and the final vessel has been commissioned in the near future, he pointed out, and the final vessel designated the name Her Majesty's Bahamian Ship Madeira, has already seen action. "As many are aware, and as mentioned by Minister Nottage, HMBS Madeira and her courageous ship's company was successful in apprehending two Dominican vessels last year November," he said. "In a failed attempt to escape, one of the poaching vessels rammed the Madeira damaging her hull. Arrangements for her repair are in their final stages." He noted that those poachers were arrested and their fisheries resources confiscated, and the captured Dominicans are still in the custody of the Department of Corrections where they are awaiting completion of their court cases. Prime Minister Christie said that the second phase of the Sandy Bottom Project, which is well-underway, involves the modernization of Port facilities here at Coral Harbour, Matthew Town, Inagua and Gun Point, Ragged Island. "Already the dredging of harbours at these locations have been completed and the construction of quay walls and jetties are nearing completion," he said. The third and final phase of the Sandy Bottom project includes the construction of warehouses, workshops and the expansion of existing bases in Coral Harbour and Inagua, and the construction of a new base on Ragged Island, he added. "This third phase is earmarked for completion during the fourth quarter of this year," Prime Minister Christie said. "On completion of these phases, the Sandy Bottom Project will enable the Defence Force to further decentralize its operations in the central and southern quadrants of The Bahamas, thereby allowing optimal opportunity for the prosecution of seaborne threats that persistently plague us." "Undoubtedly, our position will be improved tremendously," Prime Minister Christie noted. "While additional manpower, ships and bases -- in and of themselves -- represent enormous steps in the right direction, we are acutely aware that to police our more than 100,000 square nautical miles of territorial waters poses significant challenges that requires considerable resources in safeguarding our nation. Prime Minister Christie said, consequently, the challenges we face can only be mitigated through deliberate, integrated, concerted and focused strategies aimed at remediating any and all circumstances that threaten the social and economic viability of our country. He added that to do so necessitates synchronization of our political, economic, social, religious and law enforcement agendas so as to achieve our national strategic objectives for a strong Bahamas. "It is only through thoughtful collective efforts will we more capably reach the shared objective of mitigating the myriad of local and transnational criminal activities that plague our country and our region," he said. "The Bahamas Government and the people of The Bahamas are mindful and grateful for the outstanding accomplishments of the Defence Force over the years." "It is for me to observe, with a spirit of gratitude, that you have driven back Dominican poachers, weathered hurricanes, and stemmed the flow of illegal migrant smuggling and much more," he added. "In summary, you have gone beyond the call of duty in answering the higher call to service. And now, we call on the members of the Defence Force once again to join forces with the Police Force in an effort to arrest crime on our streets." Prime Minister Christie said he had been advised that, to that end, the Minister of National Security has directed that the Defence Force provide the necessary assistance to the Police Force. "I have been advised that the Defence Force has since contributed personnel to the Urban Renewal Program, as well as to the Police Special Operations Division in this regard," he said. Prime Minister Christie said that the Defence Force continued to expand its maritime capabilities with the commissioning of HMBS Kamalamee that day, which is the third of the four 100-foot flora class vessels that borrow their names from trees indigenous to The Bahamas and parts of the West Indies. "The kamalamee tree is multi purposed, serving as aesthetics for landscaping purposes, as well as a variety of medicinal and manufacturing uses," he said. He pointed out that the names of the two Flora Class vessels that have already been commissioned are HMBS Lignum Vitae and HMBS Cascarilla. As stated earlier, the fourth and final vessel to be commissioned is HMBS Madeira. Prime Minister Christie noted that like the remaining three vessels of its class, HMBS Kamalamee was built by Damen Shipyards in Holland and is classified as a Stan 3007 Patrol Craft. "I am told that the vessel has been constructed and outfitted with modern technology, fixtures and armament that will enhance operational support in combating transnational activities, as well assist with disaster relief and search and rescue efforts," Prime Minister Christie said. He added that on behalf of the Government and people of The Bahamas, and on his own behalf, he again commended the Senior Command, the Officers, Warrant Officers, Non-Commissioned Officers and Marines of the Defence Force, both past and present, for their invaluable contributions towards the growth and development of the Defence Force and the security of the nation over the years. 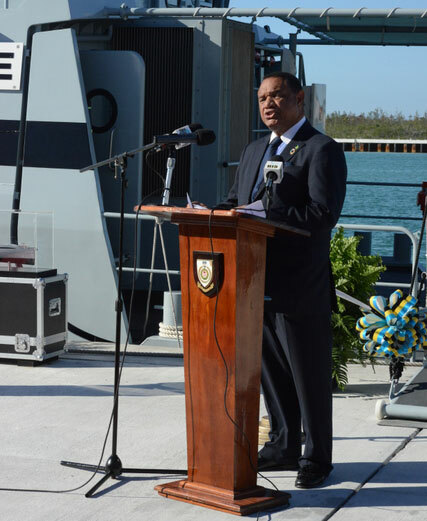 "As we formally welcome this latest addition to the fleet, it is for me also to indicate that the Government of The Bahamas is committed to guaranteeing your success as you continue to promote the peace, security and prosperity of our nation in Guarding Our Heritage," Prime Minister Christie said.